An almost perfect double top is forming on the chart. We have an uptrend where price has appreciated for a few months and then the two peaks which are about the same height. The support line is just below the current price. If it is violated a picture perfect pattern may unfold. In the summer I turned bearish on the oil sector as there was a buying panic underway. Oil stocks continued to rise into July but then stumbled badly. Their low was in mid-August, along with all the other sectors out there, as I was pounding the table to go long. Bullish percent indices are very useful in timing the market. Right now the bullish percent index for the energy sector is at 38% which is low but not too low. And for the gold sector the bullish percent is just below 50%, smack dab in the middle of nowhere. As much as I enjoy reading this blog, your forecasts and analysis on the gold sector have been largely wrong. I don’t think you really understand what is driving the gold market, and so you resort to analyzing the sector in too much of a technical matter. While technical analysis does glean certain insights and can be useful, a purely technical analysis (without a fundamental understanding) is a deadly way to approach any sector, let alone gold. In either economic scenario going forward - hyperinflation or recession/depression - gold will outperform as it always has during those times. You can’t trust the US, the US economy, or its common share - the dollar - like you could 10 or 20 years ago. You can’t trust other countries and governments worldwide who are also increasing their supplies of money - read inflationary - at high single and double-digit rates per annum. Again, as much as I enjoy your blog, you need to stick with a sector you really know best, and it is clearly not the gold sector based on your past calls and seemingly meager analysis you provide on the topic. I still think that gold is just another commodity out there. My meager analysis may yet be proven correct. Only time will tell. We all make our bad calls from time to time! Gold is a commodity, yes; but, it’s really money. I believe Gold has already switched from commodity to a currency, so I see all the inflationary policies that global central banks are adopting as beneficial to the gold price. I suppose the truth will run somewhat in between. Oil has confirmed the ‘double top’ with its close below $90. Gold will likely do the same. But the net outcome of all of this will probably be a scrappy sideways pattern defined by the November high / December low. Gold and oil have trended nicely for the last few months, but now looks a good time for a break. Are you taking any short positions on in gold? Given the fact that your next article is ‘World Central Banks Start Lowering Rates In Concert’, I’m not sure how you arrive at your gold conclusion (technicals aside). If everyone is joining the US in lowering rates, effectively opening the competitive devaluation door, than all money will be getting cheaper. As such, a competitor to paper currencies like gold should do well. Buying gold at such a high price with a double top in place would freak me out as well, but the fundamentals seem to call for a long term higher gold price. 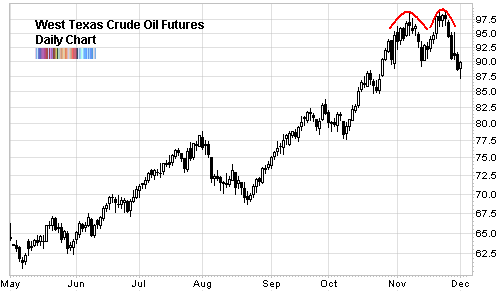 RE: the possible double top in oil … Business Week has an interesting article out tonight (05 Wed 2008) called “Why the Hot Money’s on Cheaper Oil“. Hope that link worked. If not, just web to Business Week. thanks for the link. I’ll read it over the weekend. my thinking is that if the rest of the world’s reserve currencies start lowering rates, then the differential between them and the US dollar will shrink, taking pressure off the dollar. Most educated and excellent calls on everything- congrats Babak- but I dont kno if oil and gold are going to cooperate- looks like they might be getting ready to scurry higher, especially the stocks of the producers as in XOI, XNG, OSX, HUI, XAU, ect. But, by my calculations you’re batting about .800- .850. If you catch the top on oil and gold the Pope will be sending some exorcists by your address to make sure you dont do it again. care to re-evaluate your positions on gold/oil? oil at $100. gold at $870. simply speaking, gold is honest money. and it’s calling out all the central bank shenanigans, the increasing money supplies worldwide, and the “integrity” of financially engineered paper. it is no longer “just a commodity” like it was during the 20 year bear market from 1980 to 2000.
gold is going to hit $1000 this year, and may very well exceed it. to $2000 within the next 4 years. Maybe you were just a little early on gold & oil Babak. The gold bugs are really starting to bay and howl [they always do but now even in the main stream media is quoting them], and its not even a full moon . We’re starting to hear more and more about the end of the world or at least the western financial system. Ive thought we’d get one last run for the roses in gold and oil, hold on to your hat could be a doosey, but the watch out, as the gold bugs begin frothing about the final collapse and dancing in the streets over the demise of civilization, marching on Washington to lynch The Wizard of Greenspuds and his hunchman B-52 Ben …. well too bad….we’ll find out again that it takes immaculate timing to get the end of the world right and that’ll be it for gold & oil— for a while. The 64 KKK question? How looney will they get before its over? 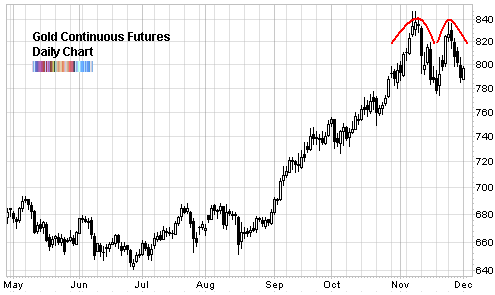 february futures hit a high of $894 today.